Flat screen and high-definition TVs are popular items to have now, but no one wants a mess of wires lying around, and that certainly doesn’t match up with a sleek and modern look in a home either. new homes in Austin, they want to design and build a custom home to your preferences, and handle all of the complicated wires and mounts for your audio-visual equipment. Newer models of flat screen TVs also now have thinner displays, and ultra thin wall mounts, leaving them only two inches off the wall, looking much less bulky than original models, and providing ways for viewers to pull it 30 inches from the wall or view from different angles. Texas custom home builder, Sterling Custom Homes knows that new technologies will fit better and be more eye-catching when coordinated by your home builder. So they will not only design the placement and installation of your equipment, but also careful placement of outlets, cable concealment, and correct wiring for voltage. Sterling has years of experience and lots of industry contacts, to negotiate pricing and manage audio-visual projects, which will save you time and money. No more worrying about having several contractors, because Sterling Custom Homes will complete your home and technology installation at the same time. As a home buyer with this incredible opportunity open to you, it does bring ideas then of having an up-to-date media room in your home, doesn’t it? 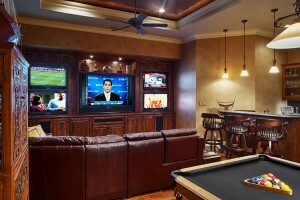 Well the builder will also make sure that your media room rivals others featured in leading home design magazines too!